Android phone owners are no longer left out of Amazon's e-book party, thanks to the Kindle app that landed in the Android Market late Monday. 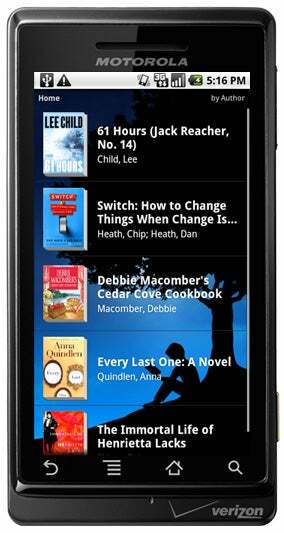 Kindle for Android offers many, but not all, of the features iPhone owners currently enjoy, including automatic synchronization between devices, adjustable text size, annotations, bookmarks and portrait or landscape modes. Missing from Android's Kindle app are text search and in-app book purchases, but Amazon told InformationWeek both features are on the way. There's no word on whether the app will get audio and video support, both recently added to iOS devices. It's too bad Android users had to wait this long, but now is an important time for Amazon to add support for Google's mobile platform. Android phones are selling well, with record sales for Sprint's HTC Evo 4G, long waits to get a Droid Incredible and a first quarter in which Android phones outsold Apple's iPhone. We're also seeing Android in larger sizes. The Evo 4G and Motorola's upcoming Droid X both have 4.3-inch screens, which should make reading e-books more pleasurable. Dell's 5-inch Streak Android tablet is coming this summer. With Amazon and Barnes & Noble engaged in a hardware battle, causing e-reader prices to plummet, software seems like the next logical battleground. Right now, Amazon has the advantage with audio and video for iPhone and this new Android app. Barnes & Noble's website has listed an Android app as "coming soon" for months. There's one other wild card to consider: Google is prepping its own digital bookstore, called Google Editions, which will use cloud storage to let readers access their books on virtually any Internet-connected device, and I'm sure the service will get prominent promotion within Android. Last we heard, Google Editions was going to launch in late June or early July, which is really soon. Just as Amazon is doing battle with Apple's iBooks on the iPhone and iPad, the Kindle App for Android may be an attempt to get an early jump on Google.